Let's have fun and exercise in school with fun and easy MUVE dancing games. Check out these kids create a group movement where creativity, team building and leadership skills are encouraged. As part of the fifth anniversary of Let’s Move! First Lady Michelle Obama is encouraging Americans across the country to give out high-fives when they see someone making healthy choices. And she’s challenging everyone to #‎GimmeFive, and show her 5 things they are doing to be more active, and lead a healthier life.This MUVE Dancing Game is called "The WAVE". The WAVE is a school activity and party game that is super easy to set up. You can actually play this without any floor markers at all. This group movement game gives every dancer the opportunity to shine in from of the whole group. One after the other each dancer will offer a specific move for the whole team to do. We all move together like a wave, all the way to the center, briefly connect with the opposite side and then retreat to the outside lines again. Then the next dancer take the lead for the next motion. (Counting Stars) This spontaneous dancing game teaches how to move as a team. We are playing with about 90 children, from kindergarten to 5th grade. This game is versatile, each snake could have two participants or can have 30+. This game is a crowd favorite, and sure to get your blood pumping. Each line is considered the snake. The head of the snake leads the rest of the body (other students) throughout the room. The head is also the MUSE (dance leader), creating the movement inspiration for the rest of the group. The snakes must work together to stay close and not run into other snakes. (Song: One World by Cheetah Girls) Small children love music and they dance naturally. So all we do is give them the opportunity to dance. The "Circle JUMP" is one of the most simple MUVE Dancing Games because it needs not set up other than getting the preschoolers into a circle formation. Then one after the other gets to jump into the middle and bust a move. (Can't Hold Us) Eighty+ 5th-8th Graders celebrate their "Peace Day" with a MUVE Dancing Party. Removable stickers on the ground divide the students in four groups. Each section as stickers on opposing sides. One by one the children step forward to lead one movement into the center and back. If a dancer can't come up with an idea, the game-leader suggest the movement to the group so as to not hold up the process by waiting. Dance Party Game for School and Home. Students get their groove on! (Slow Down) This video shows a large group of 80+ kids dance exercising at a school party. There are 4 sub-groups, each creating a circle. In each group the kids jump into the middle one after another to inspire their team with a cool dance move. This is one of the easiest MUVE dancing Games because it does not require any floor markings and can be done anywhere and anytime with however many people. (Viva La Via 2) The Tight-rope-slide (TRS) is one of the new games discovered in 2013. It is super easy to set up with any group/party. Basic idea: Imagine you and your partner/partners are dancing on a tight rope from one side to the other and back. Whoever is in the front leads the movement. (1, 2 Step) There are colored markers on the ground. Each group of 4 spots has a different color and one of them has a "double-spot" which we call "Snake-eyes." If you land on this spot you will be the first "head" and start leading your team in a SNAKE-Dance (conga-line) until the Caller calls for a "SWITCH & SCOOT." Now all dancers turn 180 degrees, the last member becomes the new leader (SWITCH) and, in an additional movement the old leader now scoots up by one position (SCOOT). This double action moves every player of the team into the leading position. Take a look. These participants have never MUVEed before and some can feel their shyness being challenged. MUVE dance exercises are great party activities for teenagers and adults alike. This spontaneous dancing game is super fun and easy for groups from 3 to 300. Just mark the spots and have a microphone for explaining the rules. (Get Lucky) At this summer's Winners Camp workshop we discovered a new MUVE Dancing Game (MDG) that is super easy to set up - actually can be played without any markings, but still works more smoothly on the Partner Grid. The name of the game is the "Tight-Rope-Slide". In this game, partners lead each other in dance, sliding as a pair (like on a tandem bicycle) from one side of the room to the other and back. Whenever the two dancers come to the "end of the rope" they turn 180 degrees and start moving to the opposite direction. The dancer in the front is providing the movement ideas until the turn, when the second dancer takes over the lead. To make it more fun we can throw in a "MIX-UP," that's when we break our partnerships and find a new partner to do the Tight-Rope-Slide again. (SOS) 96+ people are participating in this easy dance moves exercise everyone can do. The dance floor is separated into 4 sections with 24 marked spots on the ground. The Wave is a group mirroring game, where each side takes turns inspiring the other with new dance moves. In each group each dancer leads one spontaneous dance movement to the center and back. (Accentuate The Positive) This is a dance-along with 100+ people participating! A projector helps communicate the inspiring Movement Concepts "MOTIONS" as the group loosely follows MUSE Maggie on stage. 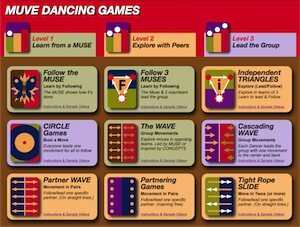 MUVE Dance-alongs and Dancing Games are easy to do. They help relieve stress, improve physical wellbeing and give people the opportunity to connect with each other. When you invite MUVE to do a workshop with your staff, faculty, assembly or party guests we will usually start with a simple dance following a MUSE. But very soon everyone gets to explore their own moves and then share them with their co-dancers. Invite a MUVE educator to "animate" your office meeting or party. Find out more at the MUVE website where you can learn to teach these games yourself. For help hire a MUVE Educator to lead your group into a fun collective mass physical activity game. Find info on the website www.muve.com.